Welcome to the 21st century and the digital age of magazines! Effective January 2018 we have completely restructured our group and are no longer a formal club with yearly or lifetime memberships or renewals. All existing memberships of any kind ended with receipt of Journal #76. This is due to the fact of rising costs of printing glossy magazines as well as postage costs (particularly for those outside of the U.S.). Going forward in 2018 and beyond, our group and website is open to the public and anyone can enjoy the articles, news and information. For those who have enjoyed our magazines, we will publish two print magazines a year that are published separately …and folks may purchase them individually as they are released. Each magazine will be available either as a gorgeous glossy magazine…but also as a digital, downloadable e-book (thus avoiding shipping costs). This will make it easier for our friends overseas to continue enjoying the magazine. Make sure you join our mailing list and you will be notified as each magazine is released. They are predicting that in 5-10 years there won’t be anymore printed magazines but we feel that there will always be a place for glossy, high quality collectible magazines. And unlike other magazine publishers who have quit print editions altogether, we have worked out a way to continue publishing in a viable manner. Anyone is welcome to purchase anything on our website or attend our events, subject to our terms of service. 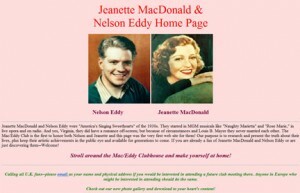 The Mac/Eddy Club was the first ever to honor Jeanette MacDonald and Nelson Eddy. The club began in 1977 – the first club ever for both stars. Our website went up early in 1996 – the very first one for either star on the Internet! Our purpose is to keep their names plus their artistic works and classic films in the public eye – and archived for generations to come. We do this in a number of ways. We publish a glossy magazine which in earlier years sold on newsstands and in cinema shops around the world; thus far we’ve published over 75 issues! 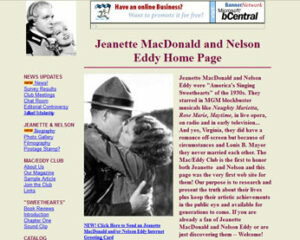 The magazine, Mac/Eddy Today, has been a research tool, containing much of the research and interviews that documented the off-screen relationship of the two stars. Much of the source material used in the book Sweethearts is thoroughly documented in the magazine. For example, that biography might contain a line or two quote from a celebrity whereas the full transcription of that interview is published in the magazine. More than just an “appreciation group”, our goal with the magazine is to pull together amazing photos, eyewitness accounts, interviews, legal documentation and other research. In past years we also sponsored concerts around the country, and in keeping with the purposes of Jeanette MacDonald and Nelson Eddy, we have awarded scholarship monies to promising young operatic singers. We’ve also done lectures and events at senior centers and donated videos, books and magazines for their enjoyment. We have also provided libraries and other non-profit groups (such as PBS Stations) with material on the two stars. One project was gathering over 20,000 petition signatures urging the United States Postal Stamp Committee to issue a MacDonald/Eddy stamp. The Committee has yet to make a decision, but the club was featured on NBC News and in The New York Times. We have one simple policy: you may love either star but respect must be shown for both. 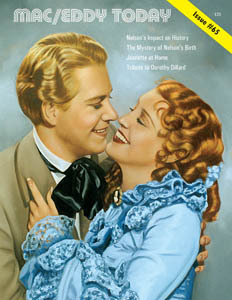 The constant bickering and animosity between the original Nelson Eddy and Jeanette MacDonald clubs proved to be detrimental to the stars during their lifetimes. At one point in the mid 1940s Nelson was so angry at the co-presidents of one of his fan clubs for belittling Jeanette on a radio interview that he threatened to shut down ALL his fans clubs. We have seen evidence that the fan club presidents from 1938 onwards were made aware that there was something going on personally between Nelson and Jeanette. Each one dealt with this forbidden issue in their own way – usually to publicly deny or ignore – based on the fact that Nelson and Jeanette never divorced their spouses so it was a topic that dared not be discussed. Nevertheless, it was as a team that Nelson and Jeanette had their greatest fame, their sometimes puzzling career choices had everything to do with what was personally going on behind the scenes…and so it is as a team that we honor them. Below, our website screenshots from past years: from left to right 2011, 2000 and 1996. The Club President is Sharon Rich, author of the best-selling biography Sweethearts: The Timeless Love Affair On-screen and Off Between Jeanette MacDonald and Nelson Eddy. (updated 2014 edition published by Bell Harbour Press.) Awarded as a “Dame of Merit” in 1995 by the Knights of Malta (Sovereign Order of St. John of Jerusalem) for her contributions to History and Literature, Sharon Rich was a co-founder of the Mac/Eddy Club in 1977, and has been its President since 1979. Rich was good friends with Jeanette MacDonald’s older sister, actress Blossom Rock (of the TV series “Addams Family” fame). She has written for several magazines, has lectured around the country about Hollywood musicals and MacDonald and Eddy, and was a featured speaker at the American Film Institute in Washington, D.C.
We do hold periodic events for fans. Sign up for our email newsletter so you’ll be notified when we hold an event in your area! Interviews with co-stars and celebrities such as Miliza Korjus, Rise Stevens,Susanna Foster, Rose Bampton and Lawrence Tibbett Jr.
Each issue is a collector’s item, filled with rare photos and a gorgeous color cover. You won’t want to miss a single issue! The journal is beautiful! It’s as if Nelson and Jeanette are back with us again. I like the feeling of warmth and caring that comes from reading this journal. B.B. What the world needs now is beauty and good taste. Congratulations on offering plenty of both through your fine club. May I always be a part of it. S.T. I don’t know when I’ve looked forward so much to a publication. Nostalgia of a high order is a wonderful thing and I can’t thank you enough for the tremendous job you are doing. P.W. Being an opera buff, I was embarrassed to admit I was also a Mac/Eddy fan. Thanks to you, I’ve come out of the closet. J.C. I used to think that perhaps I was a little strange, holding onto my addiction to the “dynamic duo,” but it’s nice to know that there are so many people like me, all wanting to know all they can about Nelson and Jeanette. J.J. Thank you for telling the truth. 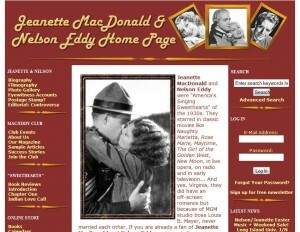 Those who love Jeanette and Nelson want to know all. You have done amazing research, and each and every journal is a treasure. L.C. I love your magazine and am glad that others beside myself have not forgotten two enchanting people. A.L. Click here to see all the magazines currently available.